In Today’s Industries, Knowing More About Your Power System Is Necessary To Get Control Over It. This Requires A System Or A Meter Which Is Capable Of Getting Measurement Continuously From Your Power System. Our Industrial Electrical System Is Of 3 Phase Power Input Viz. R, Y And B. Getting Measurement Of A Parameter In All Three Phase Simultaneously Is More Desired While Deciding The Load. 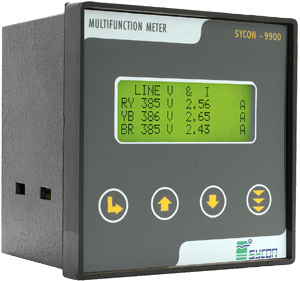 The Multifunction Meter 9900 Is Made To Fulfill This Requirement. 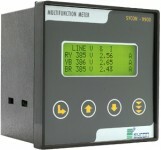 The Multi Function Meter 9900 Consist Of 20 Characters 4 Line LCD Display For Displaying Parameters. This Is The Advanced Version In Panel Meters With Small Volume And Light Weight, Capable Of Displaying Total Of 41 Electrical Parameters.